An old label on the back of the painting records the subject as the Persian Sibyl and an attribution to Simone Cantarini; when the Allegory appeared for the first time on the market, at Sotheby’s auction in 1988, this classification was rejected and an attribution to a follower of Artemisia Gentileschi was advanced. The Allegory clearly relates to a large group of paintings that spread over more than two decades of Artemisia Gentileschi's long career; from the Allegory of Inclination, painted for Casa Buonarotti in Florence, as early as 1616, to works of the mid 1630s, such as the Death of Cleopatra (private collection) and the Allegory of Fame (private collection, already with Robilant + Voena). One of the closest paintings is probably the Saint Mary Magdalene, today in a private collection in Rome (fig. 1). A work that has been widely discussed, but today almost all scholars agree to consider as a full autograph work by Artemisia, even if with different dates within the painter's corpus. Both Raymond Ward Bissell and Gianni Papi point out the striking similarities between the present painting and Artemisia's works, but both the scholars also note, in Ward Bissell’s words “a quality of excess”; something more firm and more drawn, Artemisia’s typical features are too underlined, as though someone is trying to match the results of the great painter. Adopting this viewpoint, a proposal by Ward Bissell seems particularly appealing: the scholar reminds us that Artemisia’s daughter, Prudenzia, was a painter. 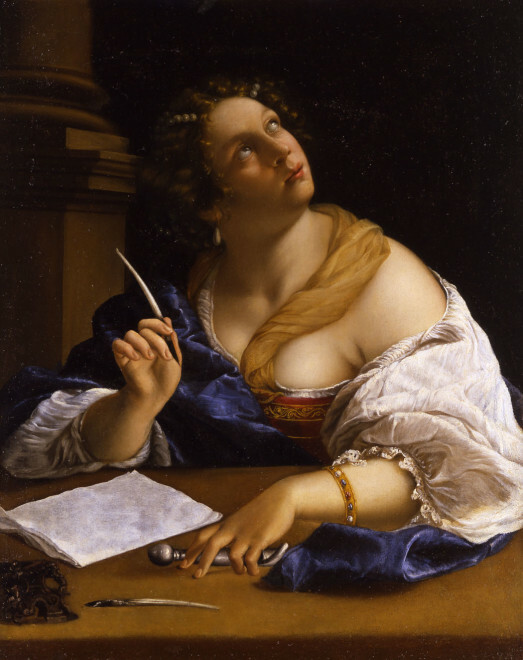 In a letter to Andrea Cioli in Florence, dated December 11, 1635, Artemisia announced her desire to send to Cioli a Saint Catherine by her and a painting by her daughter, Prudenzia, then aged seventeen or eighteen. Of course, until any work signed by Prudenzia is discovered, Bissell’s proposal should remain a fascinating hypothesis. Starting from the second half of the 20th century, Artemisia Gentileschi has enjoyed a wide success, not only in artistic circles, but even to a wider audience. Anna Banti’s 'Artemisia', a book that is in the same time a novel and a biography, - published 1947 – was a pioneer in this perspective. Studies and exhibitions have followed in the last thirty years, a movie, 'Artemisia', directed by Agnes Merlet, was released in 1997 and Artemisia also appeared in a TV-series focused on XVII century Rome. It is not surprising that Artemisia’s works have been influential and inspirational for contemporary artists. One of the most cutting edge Italian artists of the younger generation, Francesco Vezzoli, has paid an open homage to Artemisia taking inspiration for his Retorica della retorica, featuring Josef Albers & Natalia Goncharova (after Artemisia Gentileschi) - fig. 2- from the present painting.